On Apr. 30, the Islamic State’s propagandists released one of their typically gruesome set of photos. The victim in this stylized killing was a soldier for Bashar al-Assad’s regime in southern Damascus, where the two sides have clashed for years. The Sunni jihadists attached an explosive-laden helmet to the soldier’s head, hung him upside down and then dropped him to his death. 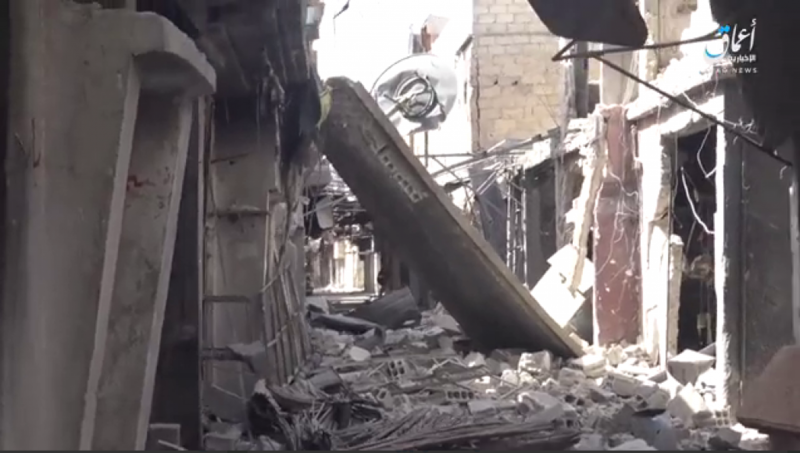 They expended a lot of resources to kill just one man, but it was intended to send a message: The Islamic State was not going to leave the neighborhoods in southern Damascus without a fight. In the days since then, the self-declared caliphate has advertised similar slayings — beheading and shooting Assad’s fighters captured in the area just outside the heart of Syria’s capital. The killings are just part of the Islamic State’s overall propaganda effort tied to the war in southern Damascus. In mid-April, the Assad regime began a new offensive intended to push Abu Bakr al-Baghdadi’s loyalists out of southern Damascus. The regime has cut deals with other insurgents, but an Islamic State contingent is determined to fight to the death. The Syrian government’s propaganda arm and pro-Assad sites have promoted their own media coverage from the battle. 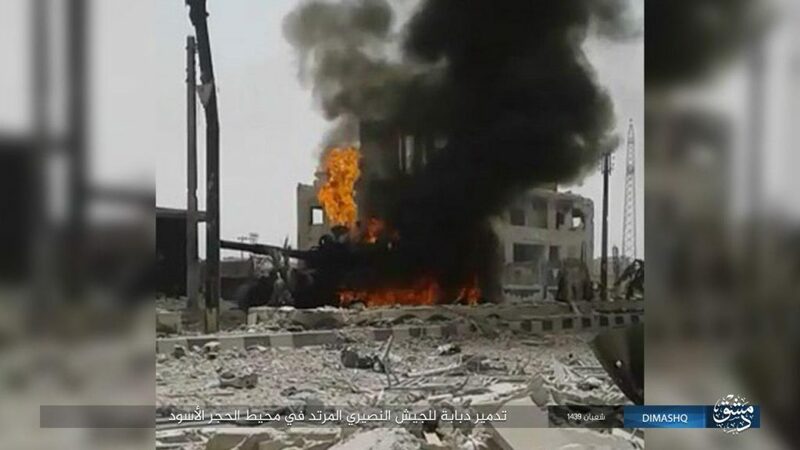 On May 3, for example, Al Masdar reported that the “Syrian Arab Army (SAA) and their Palestinian allies split the terrorist group’s large pocket.” Al Masdar, which backs Assad, claimed that the SAA was “advancing at the southeastern and western axes of Hajar Al-Aswad, along with the western axis of the Yarmouk Camp.” Similarly, social media sites associated with Hezbollah, the Iranian-backed terrorist group, posted maps trumpeting the SAA’s purported gains. However, if the Islamic State’s reports are generally accurate, then the SAA has suffered significant casualties while advancing through the neighborhoods. The 130th issue of the group’s An Naba newsletter, which was published online in early May, claimed that the SAA had suffered “huge losses” during the second week of the battle for southern Damascus. An Naba’s cover and an article on the fighting were accompanied by pictures of the corpses of several decapitated Syrian soldiers. Since the Assad regime offensive in southern Damascus began on Apr. 19, the Islamic State has issued dozens of statements. FDD’s Long War Journal has tallied its claims. In total, Baghdadi’s jihadists allege that they have killed more than 400 SAA soldiers. Of course, it is impossible to independently verify this figure. It is possible that the Islamic State is exaggerating the efficacy of its operations to boost fighter morale. Only some of the Assad regime’s casualties were documented with photos of the dead, or pictures of their identity cards. Still, multiple reports indicate that the fighting has been heavy in the Yarmouk refugee camp, and the neighborhoods of Hajar al-Aswad (“Black Stone”), Qadam, Tadamun, as well as some nearby locales. Southern Damascus isn’t the only battleground where the Islamic State is facing off against the Assad regime and its allies. Colonel Ryan Dillon, the spokesman for Combined Joint Task Force-Operation Inherent Resolve (CJTF-OIR), discussed the ongoing battles between the two sides during an Apr. 17 press conference. Dillon was asked a few times about the current number of Islamic State fighters inside Syria, but he punted on the question, telling reporters that he wouldn’t give them “numbers.” He did explain that the anti-ISIS coalition thinks most of the jihadists are “isolated” in or around two areas of eastern Syria: Hajin and Dashisha. Indeed, Abu Kamal, which is also on the Iraqi border, has long been a flashpoint in the conflict between the Assad regime and the Islamic State. They battled each other in the area repeatedly last year, as Assad and his boosters tried to expel the jihadists from parts of Deir Ezzor province. The situation in Deir Ezzor has been tense with two competing coalitions — one led by the US and the other by Russia and Iran — attempting to secure ground from Baghdadi’s men. Russian-backed forces are stationed west of the Euphrates, while Western and US-backed fighters are east of the river. In Sept. 2016, the US mistakenly bombed the Syrian military in an area of Deir Ezzor that was thought to be controlled by ISIS. Russia struck and killed members of the Syrian Democratic Forces (SDF) last year. Then, on Feb. 7, “pro-regime forces” launched an “unprovoked attack” against a SDF headquarters “eight kilometers east of the agreed-upon Euphrates River de-confliction line.” US personnel were embedded with the SDF at the time, and responded by launching airstrikes. Dozens of Russians were reportedly killed in the bombing. CIA Director Mike Pompeo said during his recent confirmation hearing that a few hundred Russians perished. Nevertheless, according to Dillon, the US-led coalition continues to give the Russians intelligence on ISIS locations in eastern Syria. “If we do see things that are — or ISIS rather on the west side of the Euphrates River, we will tell the Russians,” Dillon said during the Apr. 17 press briefing. “And we, you know, certainly hope they will act on the information that we have provided.” Dillon added that as a result of the ISIS attacks “west of Abu Kamal in pro-regime areas, we have seen some air support that has come in to be provided to those troops on the ground there” — meaning Assad’s air force and the Russians have provided air support against ISIS in eastern Syrian near Abu Kamal. Coalition forces “continue to interdict and find ISIS fighters that are trying to transit the area” around At Tanf in southern Syria as well, according to Dillon. Then, on Apr. 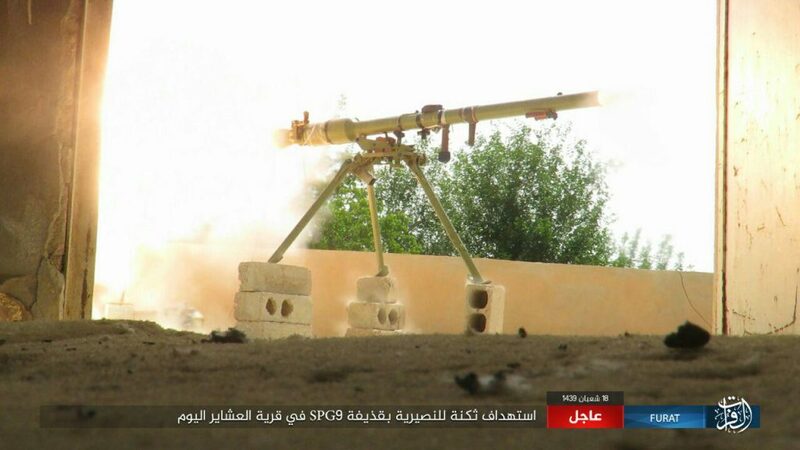 19, ISIS claimed that its men had raided a Syrian regime army barracks east of Tadmur (Palmyra), killing “multiple” soldiers, destroying a “field artillery cannon” and recovering “spoils,” including a “vehicle carrying a heavy machine gun and miscellaneous weapons and ammunition.” The claim is potentially significant as it indicates that the Islamic State is still operating near Palmyra more than a year after Assad’s forces and allies recaptured it. On May 1, CJTF-OIR lauded the SDF, the main US-backed force opposed to ISIS in Syria, as it “commence[d] operations to clear the final ISIS territories in northeast Syria.” Many SDF fighters had relocated from the front lines in eastern Syria to fight Turkish-backed forces in early 2018. That delayed the anti-ISIS campaign and the US-led coalition was eager to jumpstart the effort once again. And as the fighting in recent weeks shows, the Islamic State has enough fighters left to battle the Assad regime and its supporters, whose turf is outside of the US-led coalition’s control.